Here are some answers to questions people have had about the Transum Mathematics website. If your question doesn't appear below please send it by email to the address on the About Transum page. How can I remove the adverts from the Transum pages my pupils access? As a subscriber, when you are logged in, you will not be presented with any adverts on this website. You can also prevent your pupils being presented with adverts by registering the IP addresses they use to access the Internet. You can find more information on the IP registration form. How can I cancel my Transum subscription? Transum subscriptions run for one year and it is not possible to cancel a subscription during that year. At the end of the year the subscription will expire and if you let us know you do not wish to renew we will not send any reminders to renew. 2. Click the Profile icon at the top of the page, then select Profile and Settings from the drop-down menu. 3. Select My money on the left side of the page. 5. Select the seller whose agreement you want to cancel and click Cancel. For more information see: Paypal cancellation instructions. How can I see the trophies that my pupils have earned? Each pupil's Transum Trophy cabinet is defined by a URL ending in the pupil's email address without the @ symbol. The cabinet is not password protected in any way so anyone can view it if they have the URL. More information on our View Your Pupils' Trophies page. How can I best project the Starter of The Day? The design of each Starter is intended to look pleasing, interesting and tidy in order to motivate pupils to get involved. A cluttered screen is a turn-off for many and that is not what want in the Maths lesson. Here are some tips to inprove the presentation. 1. Press the F11 key on your PC keyboard to hide the tool bar at the top of the screen (press F11 when you want to 'unhide' it). 2. Right click on the status bar at the bottom of your browser and change the property to Autohide. 3. The browser will have a zoom feature allowing you to magnify or reduce the size of the part of the Starter page you want the pupils to see. 5. To sharpen the projected image turn the classroom lights off or pull down the blinds. Don't forget to allow the pupils sufficient light if you want them to write in their books though! Here are some more Tips for projecting Transum activities. What is my backup plan if the Transum website goes down? It happens very infrequently but once in a while the Transum.org domain is inaccessible due to some problem related to our service providers. If this happens as you are about to use a Transum resource with your class it can be very disruptive. Luckily help is at hand as Transum has two mirror sites which can be found at www.transum.info and www.transum.com. These sites contain all of the Starters, activities and webpages which can be found on www.transum.org but they don't have the latest details of subscribers and they don't contain the latest Trophy cabinets. With these limitations in mind please only use the mirror sites if the main site is not accessible. How many different computers can I log into Transum on simultaneously? While you shouldn’t share your password with anyone else it is quite acceptable to log into a number of different devices that you use. It would not be unusual for a teacher to have a classroom computer and an iPad at home both of which are logged into your Transum account. That is fair use of the subscription. What is not fair use would be publishing your username and password in the school newsletter so that everyone can log in to your account. That certainly would be “Too many simultaneous uses of the account”. How can students keep their work? Every day hundreds of students earn Transum trophies for completing exercises, puzzles or challenges. On the trophy page there is a link to a transcript which students can print out for their records. In addition most of the online exercises are designed to be print friendly with the information below the exercise being hidden. This means that they can be printed out for students to do on paper or, more efficiently, students can print out their finished work, ticks and crosses included. Browsers usually have the 'print background images' turned off by default but if not this option can be turned off in the 'Page Setup' options. Rather than printing on paper consider printing the work to a pdf file using an application such as CutePDF Writer. That way the work can be stored electronically, uploaded to an online porffolio system or emailed to a a teacher. An alternative it to take a screenshot of the finished work and paste it into a document, save it or upload it. Do you have any apps for iPads? There are no specific apps for iPads but the web activities should act like apps when accessed from an iPad. 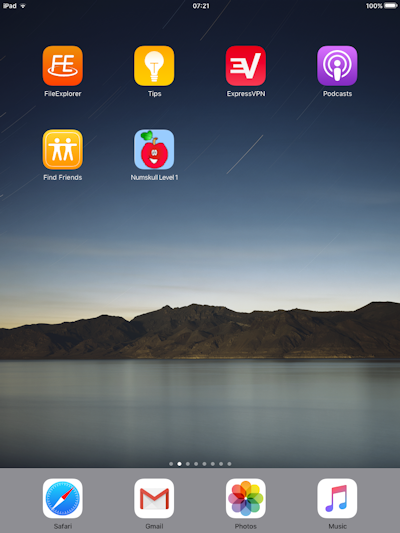 You can add icons to the home screen for your favourite Transum activities for quick access. 1. Browse to the Transum web page in the iPad web browser. 2. Tap the 'Share' button to reveal the sharing options. 3. Choose the 'Add to Home Screen' option. Now you will find an icon of the Transum apple has appeared on your home screen which launches your chosen activity directly. What is the best way to plan (and share) a lesson? Part of Class Admin is a facility called Maths Menu. It is designed to help you design and record lesson plans. These can be for your eyes only or there is an option to allow students access to them in a read-only format. In order to get started see the following step-by-step explanation of 'How To Plan a Lesson'. Maths expressions are showing as curly brackets and slashes. 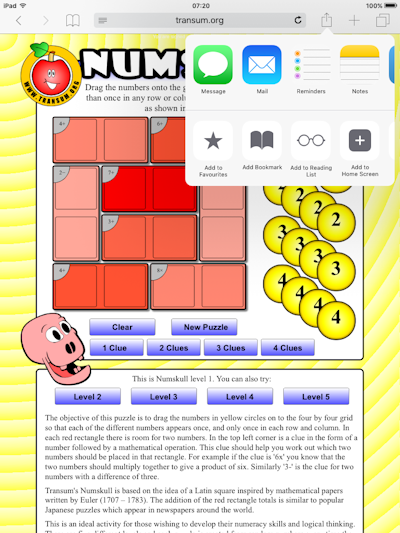 Here is a MathJax test page on another website. If you sense the problem is not just local please contact Transum. The answers to the questions found on the Transum website are available to subscribers (Teachers, Tutors and Parents) when they have signed in. For the Starters, the answers are found by scrolling down the page. For exercises and puzzles the answers also appear in red lower down the webpage. It should be noted that the numbers in many Starters and exercises are randomly generated each time the page is loaded so if a class of students are all using their laptops to do an exercise on inequalities for example, the answers on the teacher's computer will only be relevant to the version of the exercise on that same computer and not the versions the students are looking at. Students do not need to log in to Transum. The activities, investigations, exercises and puzzles do not require a log in. How do students see my lesson plans? How do I keep a record of the trophies my students are earning? How do I customise the Tablesmaster and Fast Factors High-Score charts to show only my students?